Thanks Jude, wish our bank balances were alike !! Edited by snoz, 08 May 2007 - 10:18 pm. Welcome (again) Snoz - see the link worked then I guess it would be a red TDM, wouldn't it! I live in NORTHUMBERLAND land of the great roads. 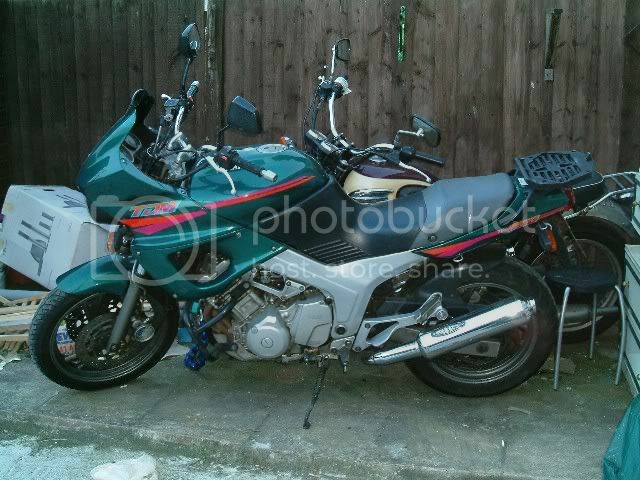 I have just purchased my first TDM a 900 in 05 gusie with ABS and only now 1000 miles and I love it. Edited by BIG BILL, 11 May 2007 - 12:50 pm. Will try and sort some out. Welcome to Snoz and Bill, you do know that you have started something dont you! Hi everyone. Thought I'd post as I always look on here whenever I need any info on the bike. I'm Paul from sunny Harlow in Essex. I ride a 1992 green TDM850 with 19k miles. I've had it for a couple of years now but only really used it for meetings in London. I've now changed jobs and work full time in the city so it's just passed it's MOT again and has now started earning it's keep as an everyday city commuter. I've had a lot of bikes over the years from R1 to C90 to Husqvarna but always had a hankering for a TDM after riding one when they first came out and I'm really impressed with it so far. Riding since 1986. First bike - SS50, fastest bike - ZZR1100, best bike riden - Ducati 900SS, next must-have bike - Moto Guzzi 1100 Sport, next everyday bike - TDM900, worst bike - Kwak GT750, bike I put most mileage on - GSX55ES (100k+ couriering), scariest bike - '85 GSX1100 (shocking brakes), best all round bike - TDM850 (current bike), bike I'll never own - any custom, favourite bike - current TDM850 Mk1, favourite accessory - gaffa tape. Cheers. I've seen a few TDM's on the way into work from the Essex side already. Hello I am from Leicester, England. I just bought a 2006 TDM900, it is my 12th bike I traded in an 2004 XT660R for it. Do not let anyone buy an XT660 they say Yamaha on them but are made in France. The build quality and list of problems I had with it should make Yamaha be ashamed. I was a member of an XT forum and we worked together to force Yamaha in various countries to recognise the problems and find solutions. so I found this forum to do some research. 1) Suspension settings-- I am 14 stone and an experimenting at the moment has anyone of a similair weight found the perfect setup? 2) I am 5'10 and looking for a better screen any recomendations? Edited by Wrant, 15 May 2007 - 06:00 pm. Hi guys, my name is Matteo (maybe you guessed from my nick!) and I am an Italian currently living in London (Docklands area). I have almost always had a bike and after a short break since moving to the UK I just got a brand new....BMW F800 ST!...Hope this is not much of a disappointment for you. In my defence I owned a Yamaha YZF Thundercat a few years ago ad hope this (partially) compensate for the BMW. I look forward to mmeting you on the road! looking for an 850 for a 900 ? thought I should introduce my self...My name is Stein..yeah like the German one litre beer glasses.. I am a Norwegain and the prod owner of a wey nice TDM 850 2001(0) mod. Unfortunately I am in london (since september) at the moment while my bike is back in Norway But luckily I am going back in a few days and is looking forward to get the bike out of the garage again ..I know us summer riders are dodgy but thats the only option in Norway any way. Norway is a great country for riding a bike over the summer though, nice and twisty roads although they can be a bit bumpy especially in the spring but this is what the TDM is good at in my opinion (atleast compared to the average RR bike) well thats enough blah blah... Hope to see lots of TDMs at the Norwegian roads this summer. Edited by rider_for_fun, 22 May 2007 - 08:16 pm. Another Norwegian here. As you might have seen in other threads I've recently gotten my '91 black 850 back on the road again and rejoined Carpe (which has changed quite a bit from when I last hang out here), and have suddenly remembered why it is fun to ride a bike. I live in Stavanger on the southwestern coast, where I'm a computer software programmer geek/old fart working for the oil industry here. I do programming and database meddling, mostly. I've got a 2001 F650GS as well. With the TDM back on the road it will mostly be used for commutes on rainy days. And I guess I'll still be using it when wifey decides to go along for a sunday cruise on her Shadow - riding a TDM that slow is rather tiresome. Edited by blarsen, 23 May 2007 - 11:18 am. Just bought a '92 TDM on Monday. She's a bit rough at the moment, been stored outside for a while, but with a bit of elbow grease I reckon it'll be a nice bike for the roads over this way. Will have lots of questions as I strip me bike down and put it back together, so will see you all round.